A once in a lifetime adventure through the pristine landscape of Swedish Lapland in the Arctic Circle! Get set for an action-packed charity challenge in what is often described as ‘Europe’s Last Wilderness’. This Arctic Wilderness charity challenge will be a real test of your endurance, where you are in charge of food, digs and feeding your dogs. The challenge is basic with self-sufficient lodgings, unpredictable weather conditions as well as looking after your team of dogs! It is a mix of survival techniques and learning how to live like the Saami people. Meet your companions and the Classic Challenge Tour Manager and UK Doctor that will accompany you throughout the trip in London before flying to Kiruna, the northernmost town in Sweden in the province of Lapland. 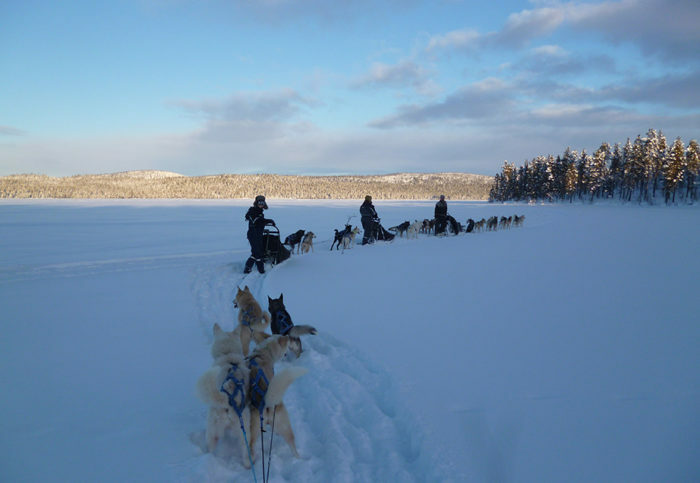 You will travel by dog sled to different beautiful locations, and have a chance of seeing reindeer along the way. The route includes a mixture of trails from tundra lowlands to high mountain areas and dense forests and frozen lakes. The first day you will travel 30-35km by dog sled, the second day a circular route of 40-45km past glacial lakes and open swamp areas, and 40-45km on the third day through snow covered mountains. Each night will be spent in wilderness base camps – and keep your eyes peeled for the famous Northern Lights! View the full itinerary here. This is a fantastic chance to help children in Darfur, whilst taking on a totally different and extremely challenging excursion – making new friends as you face the cold weather together. Sign up solo or as a group. Group sizes range from 8-15 people, so sign up soon to get your spot! The Registration Fee for this challenge is £299 and minimum sponsorship is £2500 for Kids for Kids. This may seem like a lot but includes: Flights to/ from Sweden, accommodation (camps, huts & lodges), transfers, full medical support, experienced guides and dog sledding team, specialist kit (leather mitts, Arctic all-in-one and Arctic boots), water and meals. Additionally, we would be more than happy to help you come up with fundraising ideas, send you collection tins, stickers, and other Kids for Kids promotional materials that will make this goal much easier to accomplish! Our supporters often hold events as a way of raising funds instead of relying solely on sponsorship from family and friends. Why not hold a pub quiz night, silent disco, or bake sale?! Please get in touch at contact@kidsforkids.org.uk with any questions. To learn more about this challenge and see the full itinerary visit Classic Challenge’s Website!